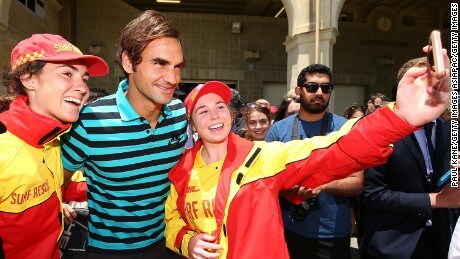 Around 6,000 fans were on hand to watch the tennis star practice at the Perth Arena Thursday as he prepared for his competitive return at the Hopman Cup after a six-month injury layoff. The Swiss is playing in the annual team competition ahead of the Australian Open — tennis’ first grand slam of 2017 starts on January 16. The 35-year-old completed the two-hour training session without a hitch, before signing autographs and tweeting his appreciation to the thousands who turned up. “It’s about just getting into the rhythm, getting into the groove. Not getting injured is obviously most important but then I think I can actually play really good tennis towards the end of the week,” Federer said on the official Hopman Cup website. On Friday, he went to Cottesloe Beach and played an exhibition on the sand, also meeting the local surf lifesavers. Federer has had a frustrating 2016 — a left knee injury sustained while preparing a bath for his twin daughters in January required surgery, and a back problem ruled him out of the French Open in May. His last action of the year was at Wimbledon in July, where he lost in the semifinals to Milos Raonic before a recurrence of his knee injury sidelined Federer from both the Rio Olympics and the US Open. Federer’s absence from the ATP Tour meant he slipped outside the top 10 of the rankings for the first time since 2001, but he says the time off could play to his advantage in the long run. “I do believe it could be very beneficial for the future of my tennis career that I’ve had this six-month layoff,” Federer told reporters in a conference call from his training base in Dubai this month.